Guests shall be received as Christ Himself (Rule of St. Benedict 53:1). 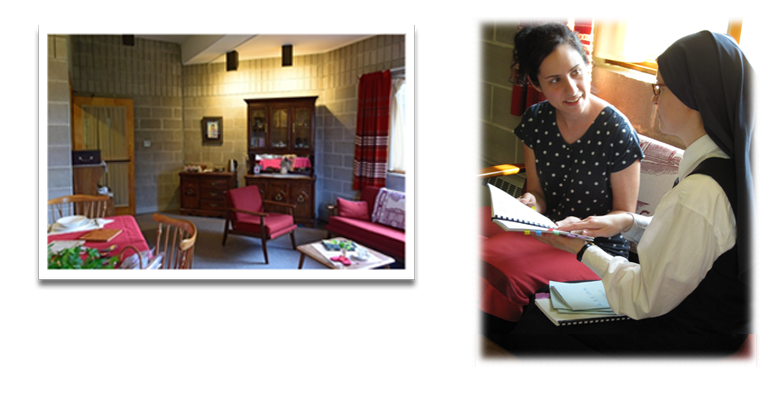 Within the monastery, but outside the monastic enclosure, are several guest rooms for women who wish to share the prayer, peace, and silence of Benedictine life. Guests of all faiths are welcome to attend Mass and the Divine Office, celebrated in Latin and Gregorian chant, or simply to stop and pray. Books with English translations are provided. Three meals, prepared by the nuns, are served daily in the guest dining room. A reading nook provides books on prayer, monastic spirituality, and lives of the saints. The Guest House grounds include an outdoor Way of the Cross, delightful views of neighboring dairy farms and nearby Jay Peak, as well as breathtaking sunsets. For more information, please call 802-744-6525 or email us at guests@ihmwestfield.com.